ECOO is a founding member of the ECV and takes an active role in supporting its work. On the occasion of World Sight Day 2014, EFAB and the ECV organised a dinner event with Members of the European Parliament on addressing the challenge of preventable blindness. ECOO professionals were also present in the European Parliament with an information stand offering digital retina photography and providing information about vision and eye health. The press release on the cost of blindness can be viewed here. The ECV press release is available here. On the occasion of World Sight Day 2013, the European Forum Against Blindness (EFAB) organised a two-day information stand and dinner debate in the European Parliament to raise awareness about eye diseases and the importance of having regular eye checks to prevent blindness. Have a look at the video to learn more. 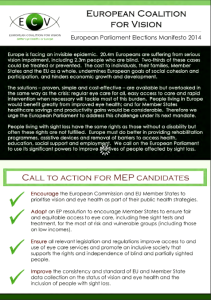 The ECV, which ECOO belongs to, calls, in its European Parliament Elections Manifesto 2014, on policy makers to tackle the challenges in the field of eye care.